Lesley wanted her wedding ring to fit in with the rustic style and shape of her engagement ring. 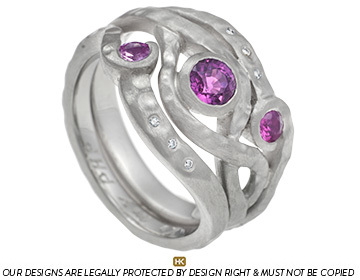 The final design has a beautiful organic flowing shape with a 3mm 0.1 carat brilliant cut pale pink sapphire set within an intricate curl. 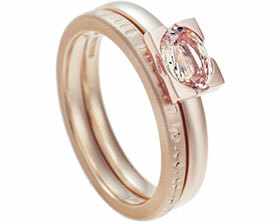 Three 1mm HSI diamonds, totalling 0.01 carats, have been flush set within the band. 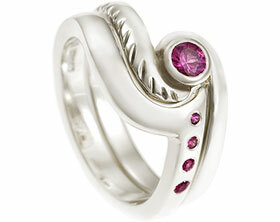 A hammered and satinised finish ensures the wedding ring complements the engagement ring perfectly.